Terlyn Cooling Tower Water Conservation Program reduces standard cooling tower water waste requirements by over 90% by utilizing the most advanced water treatment program in the world. 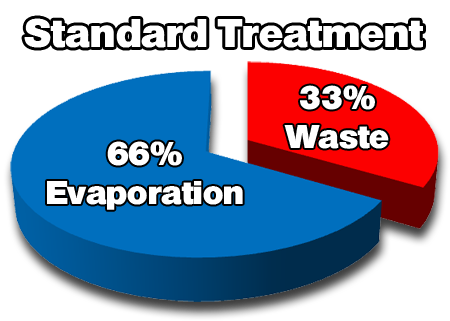 Standard cooling tower water treatment programs operate cooling towers at an average of three cycles of concentration. At three cycles, one gallon of water must be flushed down the drain for every two gallons that evaporate resulting in a 33% waste. The TERLYN program requires only one gallon of water flushed for every 49 gallons that evaporate resulting in just a 2% water waste! A scale inhibitor is utilized in all cooling tower water treatment programs to raise the saturation point of the system water; decreasing the amount of wastewaterdischarge required. A weak scale inhibitor will require one gallon of water wasted for every one gallon of water evaporated (50% waste). In this example, the minerals in the system water would be twice the minerals in the incoming water. This is known as two “cycles of concentration”, or two times the minerals in the makeup water. On average, standard water treatment programs can prevent scale formation while running their cooling towers at 3 cycles of concentration, or three times the minerals in the makeup water. This requires one gallon of wastewater for every two gallons of evaporation (33% waste). Standard water treatment programs are severely limited in the amount of cycles they can achieve by the weak molecular bonding strength of their scale inhibitors. concentrations to 30 cycles of concentration or greater! 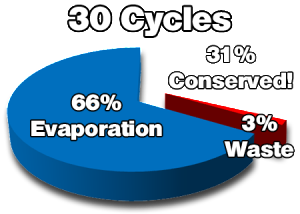 When operating at 30 cycles, only one gallon of water is wasted for every 29 gallons of water that are evaporated (3% waste). This is a reduction of the standard 3 cycles waste requirement of over 90%. In addition to preventing the formation of new scale in a system, CWT3 will also slowly clean existing scale deposits while the system remains on-line. Scale Control is the most important of the three responsibilities of a cooling tower water treatment program. A minimal scale problem in a cooling tower will simply decrease efficiency, while a severe scale problem can shut down an entire system. Scale is created when the concentration of minerals in the system water increases to a level that is higher than the saturation point of the scale inhibitor in the system water. When this occurs, the minerals fall out of the solution of the water and form hard mineral deposits throughout the system. Scale can form on virtually any surface within a cooling tower system. However, the most noticeable areas for scale to form are in the cooling tower’s fill, and on heat exchange surfaces. Poor scale control can be easily identified through visual inspection of the cooling tower. Since cooling tower fill represents the point of highest evaporation, scale build-up will occur most rapidly in the fill of a poorly treated system.